Does patient waiting time impact their experience at the doctor? Yes! Not only is it an annoyance for most people to have to wait for an appointment, it has been shown to impact their perception of the ensuing treatment and the provider. How wait times are handled is equally as important. 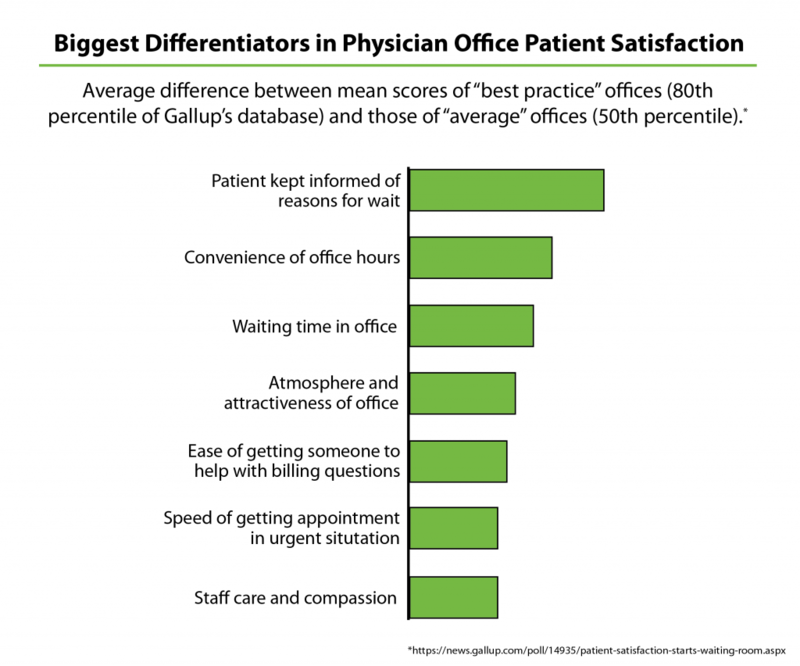 Gallup poll data shows that Keeping patients informed regarding their wait time is the #1 differentiator between patient satisfaction that differentiated “average practices (50th percentile)” from “best practices (80th percentile)”1. “Waiting time” was the third highest reason listed. Longer wait times negatively impacts the patient perception of kindness and compassion of the staff2. Patients’ perception of doctor capability and confidence in the health services provided were both diminished with longer wait times3. Patient wait times also effected patient perceptions of the care givers ability to perform health services reliably and accurately4. When patients have longer wait times, it impacts their perception of the quality of interaction they are having with the doctor, even when similar or longer amounts of treatment time is spent with them compared to individuals that did not wait as long for treatment. 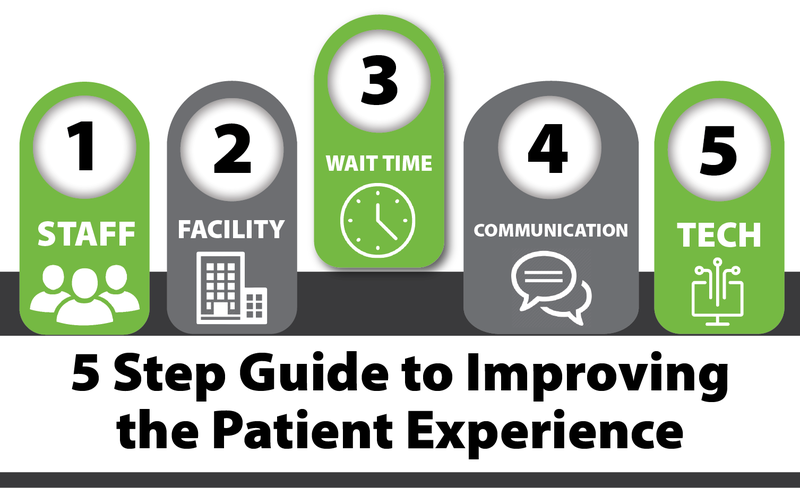 Focusing on patient centered strategies like being highly empathetic, polite to family members, and keeping the patient informed as to why there is a delay can help mitigate the negative aspects associated with longer wait times5. While not avoidable in all cases, keeping wait times in check is a healthy thing to do for any practice. In those instances when a delay is eminent, keeping patients informed and being patient centered is critical to managing those instances effectively. 1. Blizzard,R. Patient Satisfaction Starts in the Waiting Room. Feb,2005. http://news.gallup.com/poll/14935/patient-satisfaction-starts-waiting-room.aspx. 2. Spaite DW, Bartholomeaux F, Guisto J, et al. Rapid process redesign in a university-based emergency department: decreasing waiting time intervals and improving patient satisfaction. Ann Emerg Med. 2002;39(2):168-177. 3. Bleustein C, Rothschild DB, Valen A, Valatis E, Schweitzer L, Jones R. Wait times, patient satisfaction scores, and the perception of care. Am J Manag Care. 2014;20(5):393-400. 4. De Man S, Vlerick P, Gemmel P, De Bondt P, Matthys D, Dierckx RA. Impact of waiting on the perception of service quality in nuclear medicine. Nucl Med Commun. 2005;26(6):541-547. 5. Zhenzhen X et al. Associations Between Waiting Times, Service Times, and Patient Satisfaction in an Endocrinology Outpatient Department: A Time Study and Questionnaire Survey. INQUIRY: The Journal of Health Care Organization, Provision, and Financing. 2017; 54: 1–10.